Do bunion splints and braces actually work? Most people who first develop a bunion reach for over the counter remedies to control the pain and soreness which accompany the deformity. After all, who wants bunion surgery if they don’t absolutely need it? We understand completely. If you google “bunion splints” you’ll find a dizzying and overwhelming array of products, some of which make rather spurious claims. You’ll also find it difficult to look at a product description and image and decide that this is the right bunion splint (or whatever) for you. The problem is, a bunion is the result of certain faults in foot structure and function, which are inherited traits. Because of these subtle differences, each patient’s bunion symptoms and pain tolerance are unique. Some develop huge, painful bunions in their youth, and others live with a small bunion for 20 years until they opt for surgery in their mid-50’s. What are your choices for over the counter bunion products? This list could be very long, but we’ll limit it to the most common products. In spite of marketing claims, none of these remedies can actually correct your bunion, they can only (possibly) slow down the bunion development and temporarily relieve symptoms. What works for one person may be completely ineffective for another, so you’ll most likely have to try a few products until you find the right one for your condition. Bunion splints or bunion braces are the most effective products if they address the underlying foot problems. 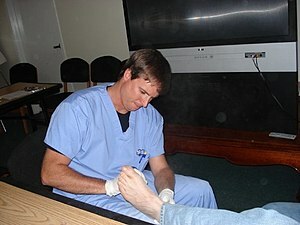 A bunion splint usually holds the big toe in place with a loop, which is connected to a binding around the mid-foot. This exerts a force which moves the toe into proper position, and relieves tension on the tendon and toe muscles. Some are rigid and can only be worn at night. Flexible splints are made of fabric and can be worn inside your shoe. Protective pads or cushions placed on the bunion protect it from rubbing on the inside of the shoe, but do not straighten the big toe. Wedge-shaped toe spreaders fit between the big toe and the adjacent toe, and move the big toe back into a straight position. This will provide some relief to the tendons in the upper mid-foot, which become sore form the stretching caused by the bunion. Toe spreaders that fit all of your toes are somewhat more helpful, as they re-align all of the toes in the foot. They can provide relief for your sore foot in as little as 30 minutes. If you can tolerate sleeping in them, they’ll relax the tendons in your foot and provide some comfort. Toe straighteners are padded splints that run along the inside of the foot and rest against the heel, to force the big toe back into proper position. If you opt to not have corrective bunion surgery, we recommend that you consider custom orthotics which provide support for your foot and can be molded to provide relief from your bunion pain. As new over-the-counter products are continually introduced, we can’t recommend one over another, but you may visit our foot and ankle healthcare products page for a wide selection of products which may offer you some temporary relief.